A Down Payment On Confirmation? Or Will McCabe Uphold Staff Enforcement Action? When the Senate President can hold a DEP Commissioner hostage and extort a political deal to make DEP stand down on enforcement of an egregious wetlands violation, we’re beyond the rule of law and all principled governing. NJ Senate President Sweeney – who is still holding Gov. 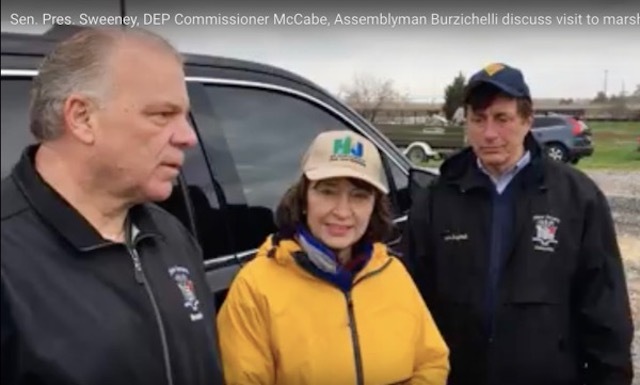 Murphy’s nominee for DEP Commissioner hostage by blocking her Senate confirmation hearings – is now demanding that McCabe abandon an enforcement action for an egregious violation of NJ’s Freshwater Wetlands Protection Act. “Acting Commissioner Catherine McCabe is aware of the situation and will be reviewing it, among a number of other issues she will be reviewing during the transition,” said DEP Spokesman Larry Hajna. Strike one – that move does not inspire confidence. Incredibly, McCabe’s “transition” review sounds a lot like the kind of review Gov. Christie DEP nominee Bob Martin conducted under Christie’s regulatory moratorium and Red Tape review process, i.e. review how to block DEP initiatives to protect the environment and instead provide “regulatory relief”. But McCabe went far beyond a temporary halt for a transition policy review. Last week, McCabe, who is an attorney, caved to Sweeney’s demands and toured the site with Senate President Sweeney – thereby totally politicizing an environmental enforcement action. Temporarily halting enforcement purportedly as part of a “transition review” is a bad idea, but at least it is defensible. Taking a tour with the Senate President, press in tow, is inappropriate, reveals bad judgement, and was a huge mistake. You can watch the corrupt humiliation on YouTube. This issue presents a major challenge to McCabe’s integrity and credibility and leadership at DEP. If she capitulates to Sweeney’s demands and kills the enforcement action for an egregious wetlands violation for equally egregious political reasons, she loses all credibility and the respect of DEP professionals. That would be fatal to her leadership of DEP. As I’ve written before, Gov. Murphy has to get the back of McCabe and stand up to Sweeney’s abuse of power. When the Senate President can hold a DEP Commissioner hostage and extort a political deal to make DEP stand down on enforcement of on an egregious wetlands violation, we’re beyond the rule of law and all principled governing. The McCabe Sweeney Tour reminds me of my own humiliating Torricelli Tour. By far the most corrupt, shameful, and embarrassing thing I ever did in my professional career was when I went to Senator Bob Torricelli’s farm in Hunterdon County to conduct a “field tour” and assure him the DEP would soon nominate the stream that flowed through his property as a “Category One” (C1) water and thereby stop nearby proposed development and keep his backyard green. I returned to DEP Trenton HQ after the “tour” and immediately met with Commissioner Brad Campbell to advise him that I really resented him making me do that and that I’d never do anything like that again. In response, Campbell claimed that he had not ordered me to conduct the tour, but his political staffer sure made it sound like that when she set it up and essentially directed me to go there. After I left DEP, I leaked the story to the Star Ledger, who reported a big Sunday edition page one story: Protections for Streams Guard Other Interests – and in that story, Campbell is quoted flat out denying he knew anything about the Torricelli Tour, which is a big lie, because I told him about it. I realize that the ends don’t justify the means, but in my Tour, at least the corrupt politics were working to BETTER PROTECT the environment, not like McCabe’ Tour, which is designed to thwart enforcement of wetlands laws for an egregious violation. We arrived back in Jersey just in time for what my email inbox said was the quarterly meeting of the EPA Community Advisory Group (CAG) for the Curtis Specialty Superfund site along the Delaware River in Milford NJ. I’d previously attended CAG meetings and written about the problems with the cleanup and demolition, so I thought I’d drop in and check out the show. My primary objective in attending this meeting was to impress upon EPA the need to immediately stabilize the stream bank (see above photo). On January 30, 2012, representatives of the United States Environmental Protection Agency (USEPA), United States Fish and Wildlife Service (USFWS), New Jersey Department of Environmental Protection (NJDEP), IP, GP and ARCADIS met at the site to develop a plan to mitigate the unstable conditions of the slope of the Q Creek bank adjacent to the former Coatings Facility Area (CFA). Following the meeting, IP and GP proposed a two-phase Slope Area Mitigation (SAM) to provide long-term stability for this portion of the site. The PCB contaminated soil removal didn’t occur until fall 2013 – but, since EPA and DEP knew about heavy PCB contamination of the coatings area soils and stream bank steep slope and obvious flooding risks, why wasn’t this work done YEARS ago to prevent the obvious washout risk that occurred? The 2010 sediment samples were collected from depositional areas within the Q Creek channel (cobble and gravel substrate) along each transect at locations selected to replicate the 2007 locations where practicable. Aroclor 1260 was detected in sediment in 2007 but only in one 2010 sediment sample collected adjacent to the CFA, suggesting that PCB contamination was localized and may have been mobilized during subsequent high flow events. In contrast to that, albeit downplayed, science, i.e. “may have been mobilized during subsequent high flow events”, check out how EPA spun the issue in the media: Superfund sites along Delaware River escaped major Hurricane Irene damage, EPA says. In July 2003, Curtis Specialty Papers shut down its operations and declared bankruptcy. The facility was abandoned and left unsecured. MILFORD – The Curtis Specialty Paper Superfund Site, where a woman died on Friday after falling from a catwalk, has “security surveillance, lighting and fencing to discourage trespassers,” according to a federal Environmental Protection site. The former paper mill, located in Milford adjacent to Alexandria Township, has been closed since 2003 and became a Superfund site in 2009. Rachel Elizabeth Curry, 20, of Holland Township, was at the site with friends at approximately midnight when she fell off a catwalk near a smokestack. This is sickening and unforgivable. We will write about the meeting after we can get past this disgust I now feel. Although this tragedy occurred in 2016, I only learned about it last night informally and just now Googled the news story. This kind of tragedy dwarfs the malfeasance by the corporate polluters and lack of a spine by EPA and DEP bureaucrats. Acting DEP Commissioner McCabe’s testimony to the Assembly Budget Committee this week revealed that $69 million in Volkswagen enforcement fines would be diverted to the General Fund (see NJ Spotlight story). Question: In October 2017, New Jersey reached a separate settlement agreement, totaling $69 million, with Volkswagen for violations of State law. How does the department plan to spend this money? Has the department sought, or will it be seeking, input on how to spend the money? What requirements and restrictions does the settlement agreement impose on how the money can be spent? Answer: The settlement was negotiated by the Attorney General’s office for violations of the Air Pollution Control Act and the Consumer Fraud Protection Act. The $69 million penalty was directed to the General Fund, consistent with the disposition of all penalty receipts. The SCR is not precise regarding the settlements and revenues covered. For example, would a Water Pollution Control Act or Freshwater Wetlands Act settlement be included within the scope of the SCR? It appears not. To promote the policy objectives of the SCR, all DEP enforcement revenues could be dedicated. The other kind of settlements an revenues I asked for precision on include not only enforcement, but cost recovery and the Hazardous Discharge Site Cleanup Fund, which collected over $105 million in the last 2 years (FY’17 and FY’18, see attachments) and are not Constitutionally dedicated NRD funds. But Senator Smith – and NJ Spotlight – were listening exclusively to the Keep It Green Coalition (KIG) and failed to amend his Resolution. NJ Spotlight failed to even mention the issue in its cheerleading coverage. The KIG coalition was simply too stupid to even understand the distinction between NRD settlement money, cost recovery, HDSCF and enforcement penalty receipts. [KIG] don’t want the public to figure out what a HUGE mistake they made by opposing dedication of Natural Resource Damage (NRD) settlement funds and expanding that NRD dedication to ALL cost recovery and enforcement settlement agreement funds. The original introduced version of SCR84 included the NRD funds dedication. That provision could have been expanded by a simple amendment. Instead of seeking that amendment, the KIG fools OPPOSED IT ALL! But in a Green version of the Peter Principle, they are swimming in millions of dollars of Foundation grants. The implementation of Clean Water Act Section 401, which provides states with the opportunity to consider the potential water quality impacts of infrastructure projects requiring federal approval, has proven particularly challenging and would benefit from further direction from the Administration beyond what was included in the Legislative Outline. Recent implementation of Section 401 has created much confusion and frustration and has resulted in significant delays to infrastructure projects. Moreover, some states are improperly using Section 401 to hijack the permitting process for pipelines that transport natural gas in interstate commerce. The Gas Council’s letter frames and messages key issues of federalism, over-regulation, and infrastructure policy in a way that resonates with the right wing corporate interests that are driving the Trump administration, an argument that is music to their ears. The Trump administration is likely to do the same deregulatory favors for the gas industry via FERC that the Pruitt EPA has done for coal, oil, and gas industries. The Gas Council letter was written to Trump in an obvious attempt to influence the Federal Energy Regulatory Commission (FERC), which just began hearings to review its policy on natural gas pipelines. The powerful gas industry – and their champions in Congress and the Trump administration – want more pipelines, more gas exports, and for FERC to expedite their current rubber stamp, making FERC approvals faster, cheaper, and more even reliable, while excluding pesky environmental groups and landowners. The media and even NJ’s leading environmental Congressman Frank Pallone are narrowly focused on FERC and landowner interests (exercise of eminent domain). But Rep. Frank Pallone (D-NJ), E&C’s ranking member, said he hopes FERC’s review of its 1999 gas pipeline certificate policy [PL18-1] will lead to greater protections for property owners. “For years, I have expressed concern with the process FERC uses to review pipeline applications, and its tendency to green light the construction of potentially unnecessary pipeline projects,” Pallone said. “Homeowners in the path of a pipeline have little recourse to stop pipeline companies from seizing their land through eminent domain. Meanwhile, NJ Spotlight has not reported on the Gas Council’s letter and continued its blackout of the 401 WQC issue, with a story today on the FERC review. When will media, pipeline opponents and NJ legislative leaders address the Clean Water Act 401 WQC issue? When will they begin to publicly call on Gov. Murphy to exercise that power to kill proposed pipelines, including PennEast? The gas industry clearly sees that power as its most serious threat. Gov. Murphy, who criticized Gov. Christie’s environmental policies and campaigned on a platform characterized by the media as “bold green leadership”, was strongly backed by NJ’s environmental and conservation groups, who spent $335,000 to help elect Murphy. However, a close read of Murphy’s “Protecting the Environment” policy plank of his platform reveals that it is vague, couched in terms of “building a green economy” thereby making economics co-equal with protections, and was limited to just 3 issues: climate change, protecting the shore, and preserving open space. He issued an issue specific policy on protecting the Delaware River from fracking (but not pipelines the carry fracked gas). There is nothing about the need to restore DEP as an institution, strengthen the role of environmental regulation, or reform specific policies on clean air, clean water, toxic waste management, etc. Murphy issued another campaign platform called “Building a Green Energy Economy”. It too was vague, but it embraced a more expansive issue set, including rejoining RGGI, promoting off shore wind, energy efficiency, solar, and energy storage. But despite the ambiguity and narrow scope of Murphy’s policy agenda, the press and environmental groups applauded and, in my view, basically exaggerated Murphy’s commitment to protecting public health and the environment. That exaggeration and cheerleading continued after the election. After the election, the Murphy Transition Team was stacked with corporate interests, moderate conservationists, and recycled Corzine era lobbyists. The Transition Report on Energy and the Environment did little to flesh out the details of the Gov.’s broad campaign themes in terms of advocating specific policies and regulations. Instead of a “sea change” and “complete break with the Christie era”, we’ve seen lots of evidence of continuity (again, with exception of fracking in the Delaware watershed, but only after the DRBC had already proposed rules to ban it). At the federal level, while Trump EPA head Scott Pruitt is very vocal and very busy dismantling Obama era regulations, Gov. Murphy and his DEP Commissioner are silent on repeal of Christie Executive Orders and a host of regulatory rollbacks. 1. diverted $136 million of Clean Energy Funds – a “clear break” with his multiple campaign promises to restore NJ’s leadership on climate change. 2. diverted $69 million of Volkswagen settlement funds. 3. rubber stamped Christie’s NRD groundwater pollution settlements with Big Oil – an echo of Christie’s sweetheart deal with Exxon. 5. negotiated a billion dollar nuclear bailout bill with Senate President Sweeney’s gun to his head. 6. Caved to Senator Sweeney and compromised aggressive renewable energy goals as part of the nuke bailout legislative package. 7. maintained silence on the PennEast pipeline controversy, while filing a diversionary FERC lawsuit based on protecting private property rights, not water quality or addressing the climate crisis. Murphy’s AG also rejected PennEast compensation offers based on the economic value of public lands, not water quality and other environmental impacts. 8. failed to take a position or try to block legislation that would promote Dupont’s ability to import and treat fracking wastewater and dump into the Delaware River. As a result of that lack of leadership, the bill is now on the Gov.’s desk. 9. Acting Commissioner McCabe has yet to be confirmed and is being held hostage by Senate President Sweeney. This essentially perpetuates Christie DEP policies. 10. McCabe installed Sweeney’s former Senate staffer, unqualified political operative Eric Wachter, as Chief of Staff. 11. McCabe hired former Gov. Corzine’s environmental policy aid, Deb Mans – while shutting out longtime NJ environmental leaders. 12. McCabe continued Christie’s abuse to allow the Water Supply Advisory Council to meet behind closed doors. 14. McCabe continues the Whitman to Christie pro-business, anti-regulatory, “flexible” streamlined permit” air pollution policy (a policy that impacts all DEP permit programs, not just air). 15. McCabe continues Christie DEP’s constant practice of downplaying public health risks and Press Office fact free propaganda on alleged improvements in water quality. 16. McCabe has continued to promote feel good and counter-productive voluntary “stewardship” policies. 17. McCabe has continued Christie’s “engineering” approach to shore protection. The very first press release McCabe issued upon taking office was an ill advised move to double down on a terrible trifecta: 1) Gov. Christie’s climate denying shore engineering, 2) dredged material disposal, and 3) luxury boat subsidy policies (see: DEP LAUNCHES PROJECT TO REPAIR BEACHES ON LONG BEACH ISLAND USING MATERIALS DREDGED TO MAKE LITTLE EGG INLET CHANNEL SAFE (not to mention the personnel issues involved). 18. McCabe has yet to honor Murphy’s pledge to restore DEP Office of Climate Change and has not revised numerous Christie DEP misleading climate webpages. 19. McCabe has yet to follow through, after Murphy compared Dupont Pompton lakes to Love Canal, thereby emulating Christie DEP’s lip service to that community. 20. McCabe, as far as I can tell, has yet to reorganize DEP and establish her own management team. But perhaps the most significant continuity is with Gov. Christie’s “regulatory relief” policy, codified in Christie Executive Orders #1, #2, #3, and #4. Murphy clearly understands the importance of Executive Orders in establishing and communicating his policies, see: GOV. MURPHY SIGNS EXECUTIVE ORDER FOR NJ TO REJOIN RGGI. … while Gov. Murphy has found the time to issue a series of hollow symbolic Executive Orders on promoting wind (just sandbagged by his BPU! ), rejoining a lame RGGI – with a rhetorical EJ policy too – and another that establishes a Council on Economic Advisors that elevates the role of economics and undermines DEP’s role in climate, energy and water resource infrastructure policy, there are several really bad Executive Orders by Governor Christie that remain in place, including Executive Order #2 (“regulatory relief”; cost benefit analysis, and federal consistency policies) and Executive Order #3 (slash “job killing red tape”). Christie’s rulemaking scheme in Executive Order #2 includes an “advanced notice of proposed rules”. This allows private parties, like the lawyers for major corporate polluters, the opportunity to conduct a “pre-proposal review” of any rule DEP is contemplating before it is published for public comment. As Eric Clapton said: “kill it before it grows”. That is corruption in plain sight. Yet not one media report on it. So Gov. Murphy’s continuing silence on and failure to repeal Christie’s Executive Orders is revealing and deeply troubling.